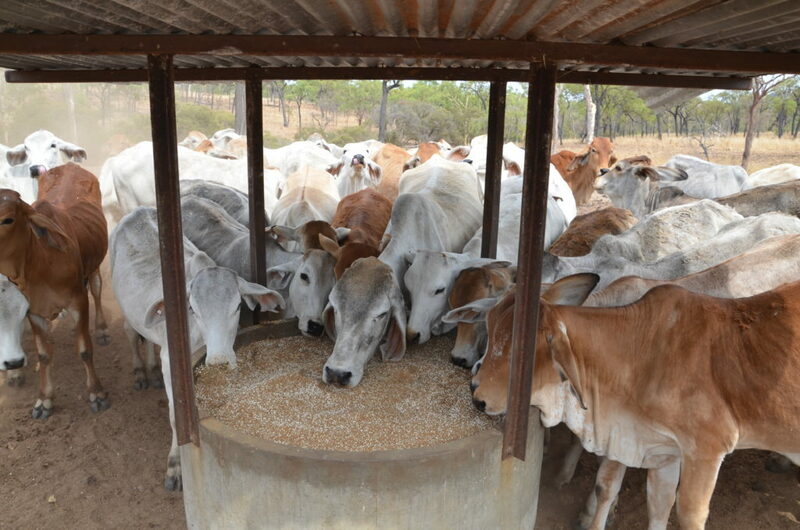 Phosphorous deficiency is a major problem for grazing cattle in much of northern Australia because of the low soil phosphorus levels in many soils. Whilst phosphorus (P) is important in all bodily processes, the major impact of P deficiency in cattle is a significant reduction in appetite. This results in lower pasture intake and consequently lower energy and protein intake. The reduction in nutrient intake affects the breeder’s ability to maintain body condition, resulting in lower weaning rates and increased mortality. Milk production is also reduced leading to lower weaning weights. In growing cattle, the lower nutrient intake produces lower growth rates. All of these impacts have serious consequences for production and profitability. Other symptoms of P deficiency include bone chewing (increases the risk of botulism), chewing of other objects (rocks, sticks, wire, etc. ), stiff gait, peg leg and bone breakages. It is important to know if a specific mob or paddock is P deficient and if cattle will respond to P supplementation. There are a variety of ways to assess whether P deficiency is a problem. Observation – symptoms of P deficiency in cattle are described above. Soil and pasture tests – soil and land type mapping and information can give an indication of the potential for a P deficiency. See the Land types of Queensland page for more information. Soil and pasture tests can determine the P concentration in the soil and plants, however they are of limited value because most grazing paddocks contain a mixture of soils and land types. The selective grazing of cattle means that simply testing the available plants is not representative of the diet consumed. Blood – the ‘P-screen’ test is currently the most reliable method of assessing the P status of a mob of cattle. This test cannot be used on breeders, therefore samples from growing cattle (not lactating or pregnant) running in the breeder paddock are used to assess the breeder mob. Testing is undertaken at the end of the wet season while growing cattle are still gaining weight and not on P supplements. Watch this webinar for more detailed information on diagnosing P deficiency: “How do we identify and evaluate phosphorous deficiency in grazing cattle”. Developing a phosphorus management plan for a property starts with understanding the relative productivity and P status of land types within paddocks. Land type mapping is an invaluable resource for property planning and herd management. Land type maps can be obtained using FORAGE or Qld Globe and land type information is located here. Phosphorus management has an overall effect on the management of a herd and the timeliness of operations like moving cattle, weaning, joining period, supplement delivery. You can use something like this example herd management calendar to plan your year. Lactation significantly increases the P requirements of breeders, therefore weaning management is an important component of managing P deficiency. Timely weaning of breeders and if appropriate, early weaning, enables breeders to better cope with low P pastures. The reduced requirements for energy, protein and P as a result of weaning can markedly improve body condition. Calving at the most suitable time for the region and avoiding cows lactating for long periods in the dry season will also mitigate the effects of low P diets. Where controlled mating is not feasible, breeder segregation systems can enable out of season calving cows to be better managed. For more information about the nutritional management of breeders, including managing the breeder body condition score to maximise reproductive potential, click here. In the wet season when energy and protein levels in grass are at their peak, P is the first limiting nutrient on P deficient country. Correcting this deficiency in the diet allows cattle to increase their intake of energy and protein from the grass, meaning there are huge productivity gains to be made in supplementing with P in the wet season. The challenge for most producers is getting cattle to eat a supplement when there is green grass everywhere. Because of the high P requirements for late pregnancy and lactation, P should be included in dry season supplements for breeders in deficient country. P can be fed to cattle in the form of loose licks, liquid supplements, blocks, or via water medication. Supplements need to be assessed on the cost of supplying the nutrients required, infrastructure requirements and the practicalities of feeding. A critical component of supplement selection and management is ensuring that the required nutrient intakes are achieved in the most cost effective manner. Consequently, the palatability of supplements is an important consideration and may require changes to achieve the target intake. Technical grade mono ammonium phosphate (MAP) can be added to roller drum and dunder mixes. Technical grade product has to be used because fertiliser grade products can contain unacceptable levels of fluorine and/or heavy metals. Target P intakes are often not achieved. Water quality can present problems with medicator operation. It is important to know the P supplement requirements of the classes of cattle at different times of the year on the property’s land types. 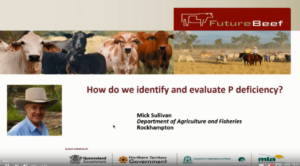 More information on cattle P supplement requirements can be found in the “Phosphorus management of beef cattle in northern Australia, PDF 2.2 MB)” handbook. Feeding P in the wet season can be challenging. To achieve target intakes, time has to be invested in identifying the most suitable P source and supplement composition and training animals to eat supplements. Good supplement intake records are critical to ensure target P intakes are achieved and for managing the cost of supplementation. Download our Lick intake calculator (Excel spreadsheet, 200 KB). Economic analyses and producer case studies demonstrate that P supplementation in deficient country is a very cost effective strategy for beef businesses. More information on the latest P economics and the benefits modelled for beef businesses in central Queensland can be found in an article written by Dr Maree Bowen (DAF Principal Research Scientist) and Fred Chudleigh (DAF Principal Economist), “Improving beef business performance with phosphorus supplementation“. A research project at the Victoria River Research Station (Kidman Springs), NT, has found a return on investment of over 300% over the period of 2017-2018 due to increased reconception rates in the supplemented heifers and heavier weaners produced by those females. 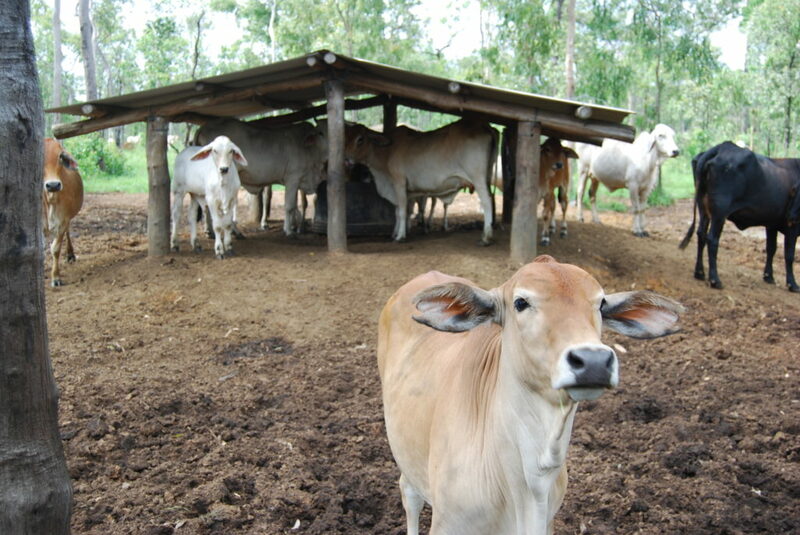 Read more about the “Effect of phosphorus supplementation on Brahman females at Kidman Springs” project. Our FutureBeef staff are here to help! Contact your local extension officer to talk about your Phosphorus management plan (Word document, 200 KB). Images supplied by Bernie English and Joe Rolfe.